Last major update issued on December 17, 2006 at 06:05 UTC. The geomagnetic field was quiet to active on December 16. 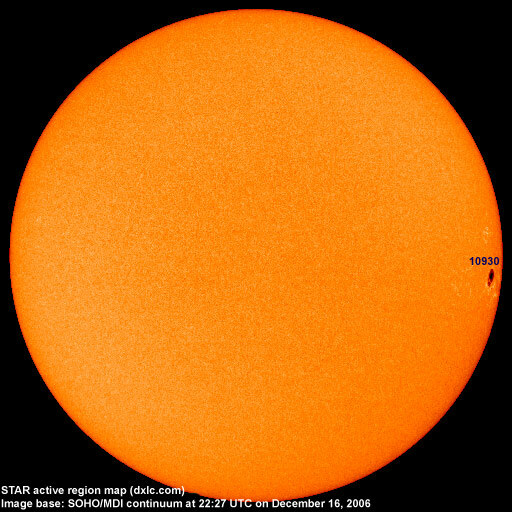 Solar wind speed ranged between 547 and 791 km/s (all day average 606 km/s - decreasing 95 km/s from the previous day). A weak solar wind shock was observed at 17:42 UTC at SOHO. This was the arrival of the CME associated with the X1 flare late on December 14. The interplanetary magnetic field has been predominantly northwards since the arrival of the CME causing only a weak geomagnetic disturbance. Solar flux measured at 20h UTC on 2.8 GHz was 82.3. The planetary A index was 11 (STAR Ap - based on the mean of three hour interval ap indices: 11.4). Three hour interval K indices: 34110243 (planetary), 24211233 (Boulder). Region 10930 decayed and lost its magnetic delta structure. 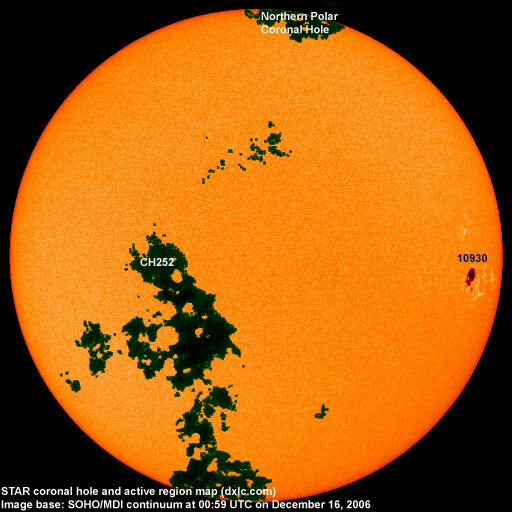 A minor M class flare is a possibility until the region rotates behind the west limb on Dec.18. December 15-16: No obvious partly or fully Earth directed CMEs were detected in LASCO imagery. 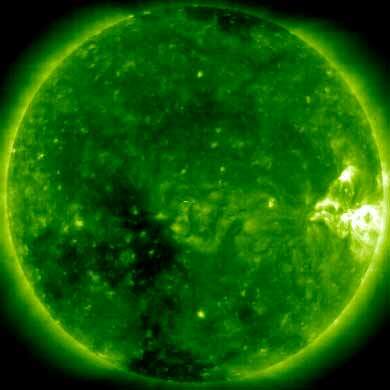 The geomagnetic field is expected to be quiet to unsettled on December 17-18. A high speed stream from CH252 could cause unsettled to minor storm conditions on December 19-21. Monitoring remarks from a location near N58E06: Very few trans Atlantic stations were audible at 04 and 05h UTC and none from North America. 1520 Radio Voz (Puerto Rico) had a weak signal but was nevertheless the stations with the best signal.